On Feb. 25th, the Wake Forest men’s tennis team improved to a 9-1 record with its fifth consecutive win over a ranked opponent. Though troubled by a slow initial start during doubles play, the Demon Deacons rebounded with a strong performance in all of the singles matches. It is not often that our doubles lineup underperforms, but fortunately, each player redeemed himself during singles play. For just the second time this season, our 9-1 team was not able to claim the doubles point as Tennessee was able to win on courts one and two. Junior Skander Mansouri and redshirt junior Christian Seraphim, the No. 1 ranked doubles team in the country, lost 6-3 on the top court. Sophomores Petros Chrysochos and Dennis Uspensky evened out the game with a decisive 6-3 victory, putting all of the pressure on court number two. The tandem of redshirt freshman Alan Gadjiev and freshman Borna Gojo were unable to defeat the No. 25 ranked team from Tennessee, as they lost in a tie breaker 7-5. However, this was a mere illusion for Tennessee as their lead vanished almost immediately. Wake Forest won five out of their six matches in straight sets. Gadjiev, on court six, cruised by his opponent 6-3, 6-4. Uspensky followed suit with an even better victory 6-3, 6-2. Ranked No. 34, Seraphim beat his opponent with a 6-1, 6-3 victory at No. 4 singles. Eighth-ranked Mansouri almost made it official with a 6-2, 6-3 victory leaving the deciding point to the best player in the country. Chrysochos responded with a three-set victory (3-6, 6-3, 6-1) over his opponent on court one. This strong singles performance clinched the match in favor of the visiting Demon Deacons. Wake Forest will stay on the road for their sixth and seventh consecutive matches away from home. The Deacs will travel to face No. 7 ranked Texas and Texas Christian University. These matches will occur on Saturday, March 4, and Monday, March 6. 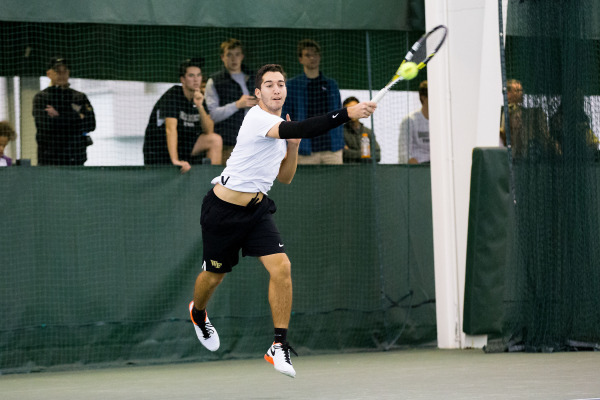 Wake Forest was able to beat the Texas Longhorns in a thriller during the quarterfinal matchup at the recently played ITA National Team Indoor Championship. There, the Demon Deacons won 4-3 and we will look to repeat in Texas.